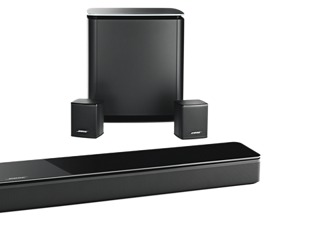 Love your new SoundTouch soundbar but want to kick the performance up a notch? Add the Acoustimass 300 wireless bass module—it's the difference between hearing bass and feeling thunder. Designed exclusively for theSoundTouch 300 soundbar, it's the best Acoustimass module we've ever designed for any of our home cinema systems. In fact, it's the best performance you can get for a subwoofer this size. It connects wirelessly to the soundbar and provides a more immersive experience for everything you listen to or watch. With its premium glass-top finish, the Acoustimass 300 wireless module offers a sophisticated look you won't find in typical subwoofers or home cinema equipment. Of course, this isn't typical equipment. This newly designed subwoofer delivers a dynamic range of bass from a powerful driver and generously sized port with QuietPort technology that virtually eliminates distortion. 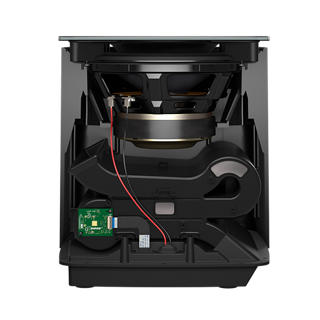 Adding the Acoustimass 300 module to your SoundTouch 300 soundbar is a huge win for your home cinema experience. Even more amazing when you consider its compact size. But that's not the only compact add-on available. Virtually Invisible 300 wireless surround speakers can complete the package for a full surround sound experience. Like the Acoustimass module, they have a wireless range of 9 metres. They stand less than 10 cm high and blend nicely into your room.